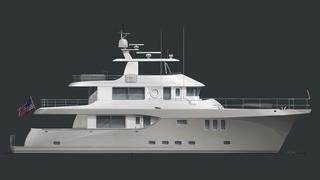 NORDHAVN 80 is a Loading... luxury yacht, currently being built by South Coast and to be delivered in 2020. Her top speed is 13.0kn and her power comes from two 375.0hp John Deere 6090SFM85 diesel engines. She can accommodate up to 8 people with 2 crew members waiting on their every need. She was designed by Jeff Leishman.